Early rain showers didn’t slow the Missouri Chestnut Roast Festival at the MU Horticulture and Agroforestry Research Center (HARC), which took place on Saturday, Oct. 6, in New Franklin. The event featured presentations, demonstrations, seminars, farm tours and several other activities. 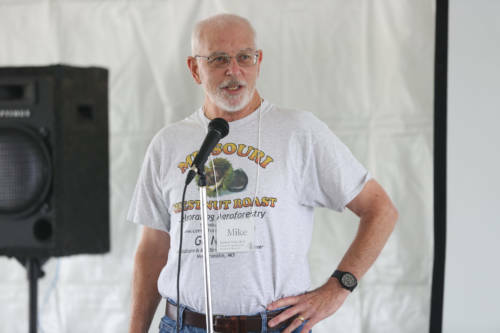 Mike Gold, interim director for the MU Center for Agroforestry (UMCA), opened the Missouri Chestnut … Expand ▸Mike Gold, interim director for the MU Center for Agroforestry (UMCA), opened the Missouri Chestnut Roast Festival with a UMCA 20th anniversary kick-off ceremony under the main tent. Gold and Shibu Jose, director of the School of Natural Resources and HARC superintendent, opened the event with a UMCA 20th anniversary kick-off ceremony under the main tent. Blanche Kelly, president of Missouri Master Gardeners, followed with an informational session on what the Master Gardeners do throughout the state. Ben Hamrah, with Peachtree Catering, then gave a cooking demonstration using chestnuts. Catherine Bohnert, with the Missouri Department of Agriculture, discussed the AgriMissouri Program helping to connect producers to consumers and consumers to agriculture. Nadia Navarrete-Tindall closed out the presentations with a discussion on the value of native plants. The Ironweed Bluegrass Band provided live music throughout the day. The Whiz Bang Science Show returned as well, showcasing science in a unique way. An NRCS rainfall simulator demonstration revealed the importance of perennial cover and undisturbed plant roots to enhance water infiltration and limit soil erosion. The Missouri Chestnut Roast Festival included a farm tour of HARC, a kids’ area and historic Hickman House tours. There were multiple vendors at the event, selling everything from elderberry juice and pawpaw ice cream to handmade ceramics and lathe-turned chestnut wood bowls. There were also numerous organizations who touted the value of Missouri’s forests, forest industry, wildlife and other natural resources. Free samples of roasted chestnuts were available throughout the event along with fresh chestnuts and chestnut trees offered for sale. “We had something for everyone at this year’s Missouri Chestnut Roast Festival,” Gold said. For a closer look at the Missouri Chestnut Roast Festival at the Horticulture and Agroforestry Research Center, visit: flickr.com/photos/cafnr/albums/72157702203981475.